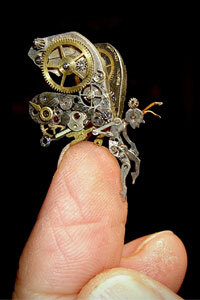 East Coast artist Susan "Sue" Beatrice travels to the past and beyond with her Steampunk clock-work designs. It's ironic that Long Island artist Susan "Sue" Beatrice has become known for her absolutely captivating sculptures made from watch pieces, clock gears, and other mechanical gadgets that smack of bygone Victorian elegance. Adept and versatile, the indefatigable artist can work magic with her hands, but the one thing she seems to lack is time. Constantly on the go--soaring from Brooklyn's Coney Island Boardwalk to Hong Kong in a single week--Beatrice is in demand for her commissioned work, her commercial expertise, and her meticulous attention to detail. No particle is too small to escape her critical eye--she is able to sift through grains of sand to create castles and mermaids and breathtaking vignettes that have even served as the backdrops for marriage proposals. Suffice it to say that the woman who is known for revitalizing and re-imagining pocket watches into Steampunk treasures has everything an artist needs, but the time to relax and unwind. Beatrice knows that she is busy, and she's thankful for it. Being a full-time artist is a dream that she has held since early childhood. In fact, her self-awareness separated her from many of her classmates: "I clearly recall a moment when it was obvious to me that I was meant to be an artist. The real epiphany for me was when I was in grade school and I realized that most people had no clue about what they were going to be when they grew up. Till then, I figured it was just hardwired into you." Born and raised in South New Jersey, young Sue came of age in a small 1950s-style housing development. "It was in the middle of farmland, and it was called Centre City, though it was not in the center of anything--let alone a city." A private commission, "Wizard of Oz" design is seemingly filled with magic and enchantment. A child of nature, who loved to wander and explore the woods, she merged her appreciation of her surroundings with her natural talents. At age 10, she was already selling "painted rocks, pastel drawings, and other art. Then I tried scratchboard and ink, and painted with acrylics and watercolors as a teen. I had several shows and my paintings were exhibited in Washington, D.C., at the Congressional Offices, when I was 15. At 16, I worked in advertising, creating logos and mockups of magazines and newspaper ads." The young go-getter had supportive parents, but they were not overly involved in her endeavors. Rather, they permitted her "the freedom to follow [her] muse." She credits them with not pushing her "in any particular direction. They never tried to dissuade me from my artistic pursuits." Studying at the Pennsylvania Academy of Fine Arts for a year, the ambitious student earned more experience and confidence at the Franklin Mint, where she began her career at age 18. Gifted and intellectually curious, she soaked up all the knowledge that this on-the-job training offered: "It was there that I learned how to be precise with my measurements and how to use light and shadow to create dramatic low-relief sculptures for coins." Able to sculpt and paint and draw, Beatrice is a creative triple threat. Her willingness to work in a commercial setting, combined with her drive to plumb her own personal resources, makes her a successful businesswoman and an in-demand artist. "Being an entrepreneur requires creativity, so I can't see how one could choose that route without remaining creative. As far as the business side of things, it's handled pretty much the same as selling any product or service," Beatrice observes. For over 30 years, Beatrice has been sculpting professionally, and she has been tapped to work for some of the biggest names in the licensed marketplace. She has had business relationships with companies as diverse as Sony, DreamWorks, Jim Henson Productions, Warner Bros., and Disney. She has fashioned likenesses for them of their most popular and best-selling franchises.Through her skilled hands, she has brought to life figurines and sculptures of the student body and faculty of Hogwarts Academy, as well as the animated characters who populated Disney World's and Disneyland's Main Streets. "The designs I've created for Disney cover a wide range of products from high-end collectibles, theme park exclusives, large mantel clocks, toys of all sorts, and even items like candy and picture frames." Beatrice acknowledges that one of the fun perks of being involved with a film franchise is that she was able to have "the opportunity to see storyboards and characters from movies as they were still in production. It was very exciting to be able to bring the characters to life in 3D based upon the line art." Drawing upon the techniques she has learned throughout her decades long career, Beatrice is perennially in demand as a commercial sculptor, and her desire to mine her own mind led her to launch All Natural Arts, which she views as a venue for her personal outpourings: "It's a creative outlet aside from my commercial sculpting, which is often for licensed characters and overseen by art directors. All Natural Arts encompasses the sea glass, stones, insect wings, moss, and other organic matter that I was using in my own art. However, I also wanted to reuse, repurpose, and recycle items whenever possible. This particularly included bits and parts of antique items. Though not every item gets its start in nature, all pieces are created with nature in mind." Under the All Natural Arts umbrella, Beatrice has received incredible acclaim. Over the past two years, her handiwork with cast-off cogs and forgotten gears has earned her a loyal following amongst Steampunk enthusiasts. The artwork of Sue Beatrice frequently blends fantasy figures with functional gadgets. Shown here, a contemplative fairy. Musing about her popularity with the sci-fi/fantasy crowd, Beatrice maintains, "The word ‘Steampunk' has grown to cover an entire fashion and style that goes far beyond its initial intent. The evolution of the term makes it a bit of a challenge to pinpoint when my art began to qualify as Steampunk. There are many followers of Steampunk that consider creations with gears and watch parts more of an offshoot of the genre, since there is no steam engine specific to the design. I've heard the Steampunk genre defined as ‘the future that never was.' It's where technology is re-imagined as it would look if it followed the path of the designs at the beginning of the Industrial Age, embracing steam as a power source instead of fossil fuels." Scouting for components to be utilized in her offerings is both time-consuming and a challenge for the artist. She visits estate sales, finds leftover parts from watchmakers, and has even received items from friends, family members, and fans who have run across pieces and immediately thought they could be utilized in her craftsmanship. Always conjuring up something fanciful and antiquated, Beatrice estimates that the working time on a piece is "two to three days, if I worked straight through. That, however, doesn't take into consideration the time it may take to collect the right parts needed. I often juggle several projects at once, setting some aside while in progress or waiting for materials to cure or just so I can get a fresh look after taking a break from it for a while. I sometimes disassemble a piece and rework the composition until it feels right to me. Usually, I get an idea for a theme from the person who commissions the piece and I run with it from there. I'll look for just the right parts to enhance the idea, and I'll allow it to evolve from there. Occasionally I will see a case or an odd-shaped part that inspires a design, which I then offer for sale." 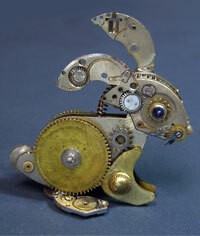 The "Steampunk Bunny" is an amazing assemblage of bits and baubles, cogs and gadgets, parts and pieces. Hearkening back to her childhood days, where she would lose herself for days in reading science books and taking apart objects to see how they worked, Beatrice can while away hours nowadays in investigating, probing, and tinkering to build the perfect fairy timepiece or watch-based bunny. She uses a variety of assembly methods for these mechanical marvels, including "lining up holes and screwing watch pieces together. Other areas are soldered or held with jeweler's epoxy." All the while, her creations are a hybrid of vintage veracity and otherworldly oddities. Her jewelry and sculptures look as though H.G. Wells and Jules Verne could have been wearing them pinned to their lapels or perched inside their vest pockets as they penned The Time Machine or Around the World in 80 Days. 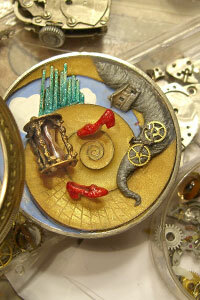 Each of her original creations has that special mix of antique authenticity and make-believe drama. Per Beatrice's spot-on philosophy, "Victorian machinery is not only beautiful and functional, but the mechanics of it can be accessed and adjusted by the consumer. Plus, the components are built to last, and they grow even more beautiful with use." At her new home and studio in Sea Cliff, New York--"it's a picturesque town full of welcoming and creative people"--Beatrice has surrounded herself with the accessories and the accouterments she needs to be productive. In her house, there are several different workstations set up for her many pursuits: "Wax carving for the toy industry is separate from the watch parts sculptures. Molding and painting has to be kept away from any sanding or other debris. Sand sculpture is done outdoors, of course, but there is a sand pit on the property for that. Pumpkins and other food carving are done either at the kitchen table or on location." Always flitting from one assignment to the next--Beatrice gives Tinker Bell a run for her money--the artist allows her customers to choose the outcome of their purchase. She never presses what her final piece is meant to be: "I'm not so sure that art needs to be defined. If someone chooses to wear or display or collect my pieces, or do all three with them, that's entirely up to the individual. I do my best to make sure that the pieces are durable enough for wearing, if that's what the owner chooses." Satisfied and proud of what she's accomplished, Sue Beatrice has built a good life for herself and her family. She has garnered a gathering of reliable customers and they have given her more than 15,000 "likes" on Facebook. In fact, she turns to past consumers for future sales: "Word of mouth and shares on Facebook have created a waiting list of commissions. Though I've had several exhibitions, none are scheduled at the moment. Due to the amount of time it takes to create each piece, I've found it unnecessary to advertise at this point. In addition to the Steampunk pieces, I am also involved with a great variety of sculpture projects, including sand-carving events for Sand Sculpt USA, Sand Castle University, and even pumpkin carving. And I also still work as a commercial sculptor for Disney and other major corporations." When it's necessary to hire subcontractors to assist in her commercial art projects, Beatrice readily does so. She is cognizant of what is necessary to make deadlines and honor contracts. Having to shuffle her time among the demands of licensed work, commissioned pieces, and her own steam-fueled imaginings, Beatrice is thankful that she is doing what she was born to achieve. That is a crucial key for unlocking a productive and successful career: "Most of us have to make a living. So, those hours might as well be spent in a fulfilling task. You may get tired of having to work, but hopefully you never tire of the creative process itself. I don't feel qualified to tell anyone how to enter into a business endeavor. All I can suggest is to make room in your life for the sake of creating. It's therapeutic and rewarding spiritually. Once you ‘chase' the money, you lose some of the enjoyment of it." Having been a professional artist for most of her life, Beatrice is still captivated by her occupation. It is both her vocation and avocation, and she's wise enough to allocate the time needed for her hired projects, as well as her more personally significant ones. Relying upon past lessons learned to design clockwork artistry that is inspirational and invigorating, Sue Beatrice is the living embodiment of Steampunk hero H.G. Wells's observation: "We all have our time machines, don't we? Those that take us back are memories ... And those that carry us forward are dreams." 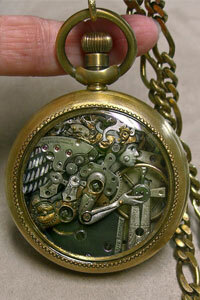 "Timekeeper" is one of the artist's favorite creations. It was a commissioned piece where Beatrice was not given a theme. Instead, she was given a "description of the personality and style of the young lady it was meant as a gift for. It allowed me total freedom, and she loved the final creation."